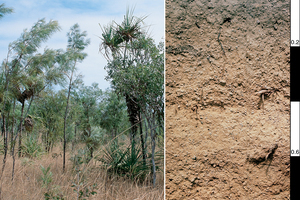 The picture on the right shows a brown Kandosol soil profile in the Darwin district, Northern Territory. On the left is a typical deeply weathered landscape near Darwin, NT. (Photographer Alan Fox). For more information see McKenzie, N. J., Jacquier, D. W., Isbell, R. F. and Brown, K. L. (2004). Australian Soils and Landscapes: an illustrated compendium. 416pp (CSIRO Publishing: Melbourne). Photographer : Alan Stewart on January 01 1966.